You are here: Home Page / AstroPlay! AstroPlay is a Digital TV stream broadcast environment, including video, audio and data streaming, which adheres 100% to the Brazilian norm. AstroPlay! has a flexible architecture that easily adapts to your company's Digital TV environment. Get to know the product's general and technical characteristics. AstroPlay! 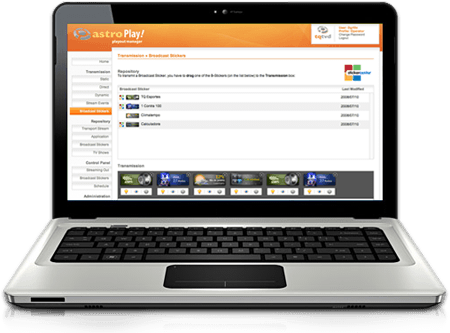 provides integration with AstroTV's Broadband Module, enabling broadcasters to install and manage applications in the viewer's digital receiver. Targeted at broadcasters, manufacturers and developers of receivers and Digital TVs, it is the ideal environment for tests and demonstrations. Targeted at broadcasters, this product is connected to a pre-existing environment of Digital TV production.